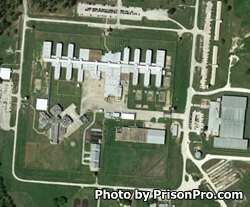 Estelle Unit is a maximum security prison located in Huntsville Texas. The facility houses a maximum of 3,148 male offenders in the main unit, an additional 212 in the SAFP (Substance Abuse Felony Punishment) and up to 120 inmates in the on site regional medical facility. Offenders at Estelle Unit range from G1 minimum security to G5 maximum security. Maximum security inmates are housed across the street in the High security unit. Estelle Unit has a large number of medical workers (156 employees) who provide medical treatment to all offenders including geriatric and transient inmates. The units medical capabilities include dialysis, UV therapy, respiratory therapy, optometry, nephrology, radiology, physical and occupational therapy. Additionally, Estelle Unit is equipped for mental health treatment and provides dental services that include oral surgery. Estelle Unit is a large facility and has many different programs. Violent offenders who are nearing their discharge date will participate in the Serious and Violent Offender Re-entry Initiative (SVORI). Inmates who suffer from alcohol and drug addiction can receive substance abuse treatment and participate in support groups such as Narcotics Anonymous and Alcoholics Anonymous. Educational opportunities at Estelle Unit include literacy classes, adult basic education and GED courses. Supplementary vocational training is offered in business computing, masonry/bricklaying, painting/decorating, and horticulture. Some inmates may be eligible to work jobs within the institution providing labor in the on site textile mill or in jobs such as maintenance, laundry and the cafeteria. Visitation at Estelle Unit is conducted on Saturdays and Sundays for all inmates from 7am-5pm. Inmates in the expansion cell block have visits on Mondays and Fridays by appointment only, contact the facility to schedule your visit. Visits are two hours in duration. Depending on the inmate's security status they will either be allowed contact or non-contact visits.